We are leading manufacturer & exporter of Radial Drilling Machine & Heavy Duty Drilling Machine. Our product range also comprises of all Geared Shaping Machine, All Geared Lathe Machine and Heavy Duty Slotting Machine. No Of Spindle Feed and Range 3 (. 050. 15) Mm/rev. 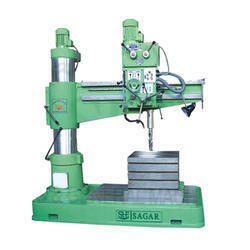 We are engaged in manufacturing, exporting and supplying a qualitative range of Radial Drilling Machine. Backed with the adept professionals the provided machine is manufactured from the supreme grade components as well hi tech technology. Our offered machine is widely used in residences and commercial places for drilling purposes. Furthermore, this machine is inspected by our quality controllers on various quality parameters to dispatch a hassle free range at prestigious patron's end.